Our coaches are all highly trained and certified professionals with a life-long dedication to wellness, health, fitness and livin’ BIG. Experienced at managing groups, as well as working with individuals in a one-on-one setting, our staff will teach, motivate and inspire you to get (and stay) in shape..
Nicola – Owner/Manager/Cardio Queen – Nic has always had a passion for fitness. She loves both ends of the spectrum, running AND weightlifting! Nic has been involved with team sports like netball and soccer (indoor and out) from a young age before discovering weight training. After discovering the joy of getting stronger, she completed her Certificate 4 in Fitness in 2002 and has been in the industry ever since. In 2006, Nic and partner Raf opened Get Fit – a boutique personal training studio in Wanneroo that has won a number of awards. In fact, many of our current members first began training at Get Fit! Nic loves the reward of showing people what they are capable of, and helping members challenge themselves. When she’s not running the gym like a well oiled machine, Nic loves her running and enjoys triathlons and other endurance events (her favourite is the Blackwood River Marathon). Crossfit is her new passion and she loves the intensity and way it makes you do movements that you should be doing all the time. And makes you huffy puffy. A highlight of Nic’s training career was training with both Ido Portal and Dmitry Klokov. 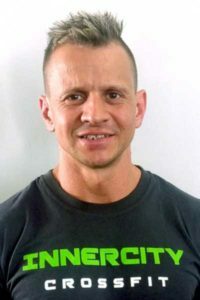 Rafael – Owner/Head Trainer/WOD Programmer – Raf is the technique drill sergeant and movement specialist at Inner City. Raf loves to learn and to pass his knowledge onto others. He is very thorough in his methods, and has a background in exercise rehabilitation. Raf has been in the fitness industry since 2005, and before this was involved in state-level basketball, state-level running, amateur boxing and enjoyed weight training. Raf discovered CrossFit in 2008, and immediately began the Level 1 Certificate. 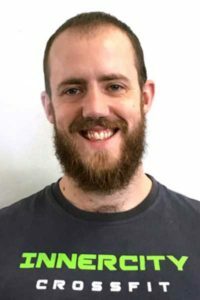 Raf currently lectures for WAFA, facilitates Kettlebell workshops, and is studying Exercise Physiology. 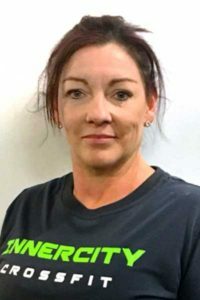 Catrina – Cat has worked within strength and conditioning from Division 1 athletes to the general population (ages 12 to 90 years) for the past ten years. 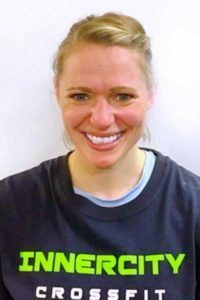 Her interest in Weightlifting has led her to integrate the lifts into training when working with clients, as well as for herself. At the university level, Cat developed and implemented weightlifting beginner and intermediate level classes for students to learn proper progressions and safety with the lifts. Cat competed in weightlifting in the United States and has transitioned into coaching since she moved to Australia. 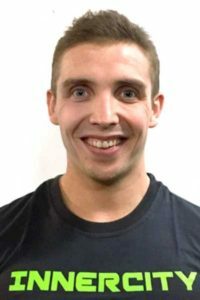 Michael – Mich’s passion for training started while playing Rugby, and Rowing in School, and seeing the results from carefully planned weightlifting sessions and endurance programs. 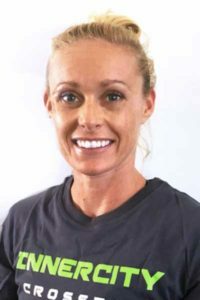 Since 2007 Mich has completed the certificate III & IV in Fitness, Level 1 ASCA Strength & Conditioning Coach and has been working as a full time professional in the fitness industry. Mich is passionate about working with his clients to reach their fitness goals. He understands that everybody is different and creates workouts around their specific needs. Having lost a significant amount of weight himself, Mich can relate to the struggles faced with starting your fitness journey as well as maintaining your goals. Fran – Fran regularly competes and represents Inner City at CrossFit Masters Competitions. She loves to work with her clients, improving their movement. Fran recently completed a 6 month mentorship with Complete Body Approach, and this training has taken her Coaching to a whole new level. Fran also works as a carer for the elderly. Fran’s goals are to complete further study in nutrition and life coaching, to enable her to provide ongoing support, sound knowledge and motivation to her CrossFit community. 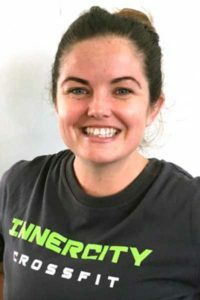 Leanne – Leanne developed an interest in fitness whilst training with Nic and Raf at Get Fit Wanneroo. However, Leanne’s true passion is working alongside your children to support their gross motor development and foster a life-long positive attitude towards physical movement. Leanne runs the kids’ classes at Get Fit Central and enjoys every minute, ensuring a fun and supportive environment for all. In addition to working at the gym, Leanne is an Early Childhood Teacher, who specialises in working with children with Autism. Personally, Leanne enjoys any endurance based sessions and keeping her training varied. Her favourite WOD is Annie. 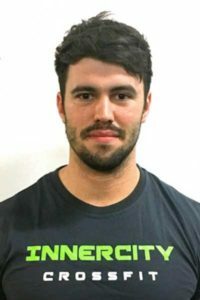 Codey – Codey has always had an interest in training, coming from a power lifting background. He is great at training people to push that little harder and surprise themselves with what they can do. Codey has worked with Nic and Raf since completing his work placement in Get Fit Wanneroo. When Nic and Raf transitioned to opening a CrossFit facility, Codey discovered a passion for the sport and now competes at an Rx level. He coaches Olympic Lifting and Power Lifting classes in the gym. Codey’s favourite CrossFit WOD is Linda. Julia – Saturday Yoga Instructor – Start changing yourself if you want to change the life around you – Mahatma Gandhi. Yoga is not just an exercise. Regular yoga practice shifts your focus inwards – this is where the change you were craving happens. Twelve years ago after a skiing accident, 3 fractures of pelvis, and lying motionless for 3 months Julia cried of happiness when she could crawl. That is when her yoga journey started. Yoga equipped Julia with asanas to work on strengthening her bones, muscles, mental strength and stability to overcome obstacles. She practices in many different styles of yoga, including Hatha, Iyengar, Ashtanga, Bikram, Vinyasa. 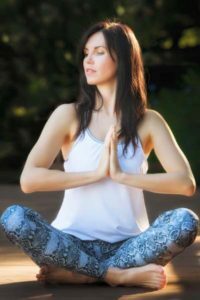 This allows her to create a unique blend of Hatha and Vinyasa flow – a beautiful flowing sequence, with holding in some foundation postures to work on proper technique and alignment. Julia tries to incorporate a number of the benefits of yoga when choosing postures for her classes. Some of them include muscle strength and definition, particular stretches and twists release stress and anxiety, others work on your emotional wellbeing and stability, including mental strength and focus. Julia comes from a business background, starting in property development and later moving to business consulting. Throughout this time she owes her success and wellbeing to regular yoga practice. Julia started regular yoga practice with Yoga in Daily Life school in Ukraine, where she also completed master training and teaching. Julia has also studied and practiced yoga in Rishikesh, the spiritual capital of India. In addition to this she also has an Australian yoga certification, RYS 200 Yoga Alliance. Julia is very passionate about yoga and all the goodness it has to offer. She hopes to share her knowledge, energy and positivity through her yoga classes. Namaste! Kathy – Kathy has been studying and practicing Iyengar Yoga since 1998. She was introduced to yoga after participating in a meditation course. At the time it felt too large of a leap from having no kind of ‘practice’, to sitting and ‘watching the mind’. As a bridging mechanism, a friend suggested she tried yoga. A bio-product of the practice was healing and rehabilitation following a full knee reconstruction. The practice played an important role in regaining the strength and full range of movement in the knee. Kathy is a dedicated student and teacher of Iyengar tradition. She has been teaching since 2000, gaining certification in the Iyengar Method in 2003, under John Leebold. When in Perth, along with teaching Yoga she works as a Massage Therapist and as a Social Trainer, working with people with disabilities.